Many fans all over the country who contributed to Haley’s Indiegogo campaign to help fund her new music video have started receiving their perks in the mail! Haley sent out the hand written lyrics to “Show Me Your Moves” first, to the 129 people who each donated $30 for the perk. Lots of happy and excited Haliens have been posting pictures of their lyrics, each of which had something a little different & unique about them. 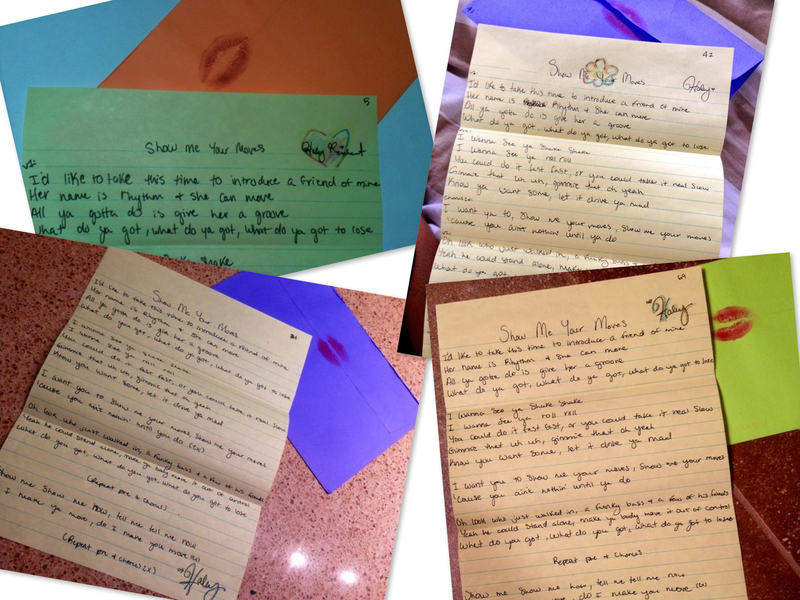 Also, with Haley being the charming young lady that she is, she sealed each letter with a kiss, literally! Now that the hand written lyrics have been sent out, there are some more goodies that still await! 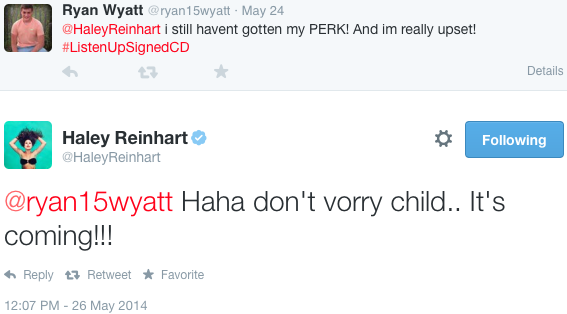 An upset fan had tweeted her that he hadn’t received his perk yet (patience is a virtue, folks!). 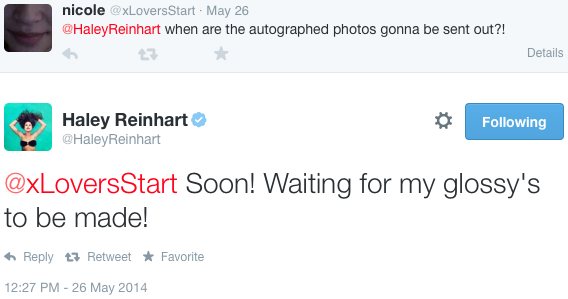 The perk he is waiting for is a signed copy of her first album, “Listen Up!”. She says not to worry, that it is coming soon! Next, she was asked when we will receive the free mp3 download of the song. This was a $5 perk, added towards the end of the campaign. It was also generously gifted to those who had already donated previously. Initially, it was supposed to be sent out before the music video was filmed, but unfortunately that changed for unknown reasons. Another perk option was the new autographed photo, in which 87 people had donated to receive. 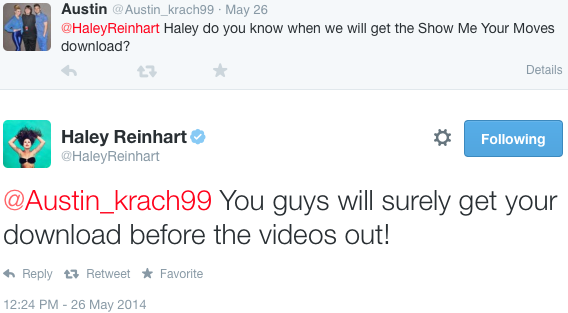 Haley states that she is waiting for the photos to finish being printed so that she can start working on them. As for everything else, the $1,000 “be in the video” perk was obviously fulfilled on Tuesday May 27th, when the music video was filmed. We have yet to hear word on when to expect the other remaining perks, such as the social media shout outs, and the special thank you videos. This is a lot of hard work, and I am sure completing everything is going to take some time. I for one, am very grateful for Haley taking the time to do all of these wonderful things for us, as I am sure she is very grateful for everyone helping her reach beyond the goal for her music video. Lots of fun and exciting stuff coming up in the near future for us dedicated fans who have stuck around through thick and thin! Love ya Haley ALWAYS great to hear from YOU!